This section contains information about this appraisal file. In addition, 'Project Management' options are available. Briefly, by entering the file name, entering 'Percent Complete', 'Project Status Notes', and clicking the 'Update Project Status' button, the Excel file is updated with this information. In addition, 'Project Status Date & Time' are updated on this worksheet. Additional options are available through the 'Project Management Utility'. The 'Property Info' section is dedicated to Property and Owner Identification information. Note how you may enter data into all fields. fields. They determine the latitude and longitude of the subject property and determine the initial maps for both the subject and the comps, although you may modify this again when working within the Site worksheet. Be sure to fill in enough of these fields for latitude/longitude determination. In case the subject property is rural and there is no 911-address, leave these fields blank, and use another mapping option available on any 'Grid' Worksheet. Remember to enter only relevant information and leave the remaining fields blank. Worksheets can be hidden and revealed to create a customized, organized, worksheet that compliments your needs. 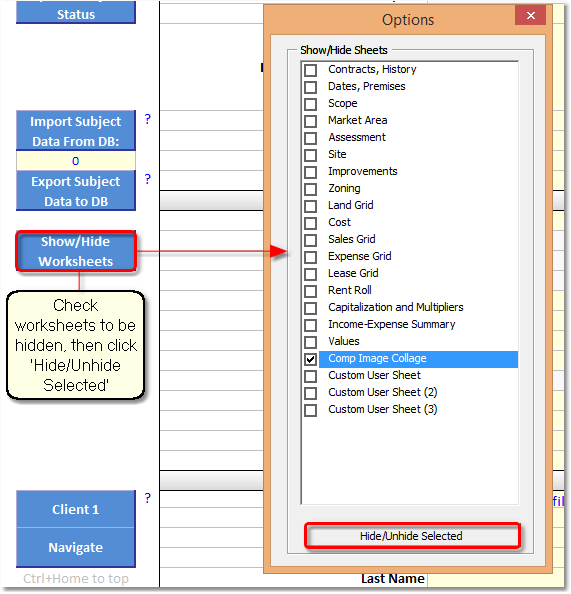 There are many ways to accomplish this, and one of these methods is the option shown on the left side of the 'Property Info' section of this worksheet, 'Show/Hide Worksheets'. As featured, click on the appropriate button and the 'Options' form appears. Click in the box next to a specific worksheet to hide it, and simply clear the box to show the worksheet. When all selections have been made, click the 'Hide Selected' button at the bottom of the form. The selected worksheet tabs will disappear from the bottom of the Excel file. This method is preferred as deleting fields and worksheets is strongly discouraged; deleting a worksheet might end up corrupting the process that merges your Excel document data with your appraisal report. 'Client', 'Contact', and/or 'Appraiser' information are stored from within a Narrative1 online database. 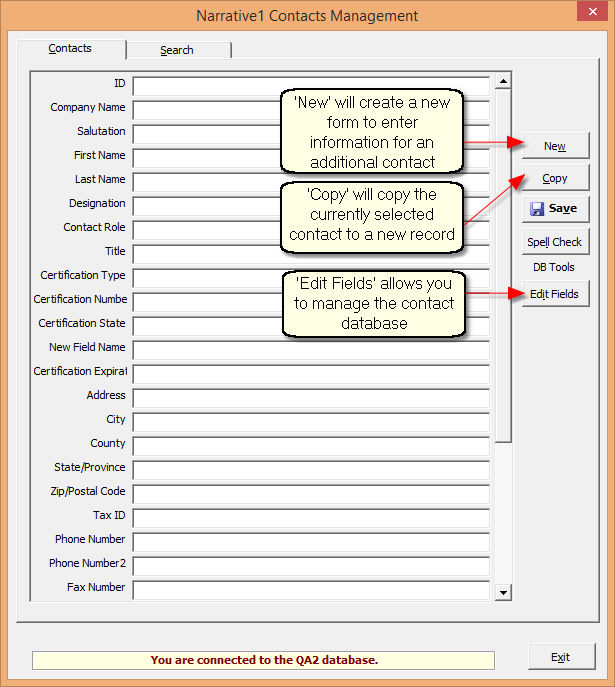 All the databases in Narrative1 work the same way: a search is performed for the desired information (in this case: clients, contacts and appraisers), the search results in a choice of records, then a specific record from the search result is selected to populate the appropriate section of the appraisal. For example, while on the 'File Info' page, the database search would include all relevant clients, contacts, and appraisers. Then, from this list, the appropriate record is selected for each section. To activate the database, click the appropriate button (client, contact or appraiser). The Narrative1 Contacts Management form will open to the 'Search Tab'. Searches can be named and saved for future use. Using the drop down in the first column to select a database field name. Using the drop down in the second column to select a relationship. Entering a value in the third column. Repeating the above three steps for each criteria. Search results appear in the lower section. 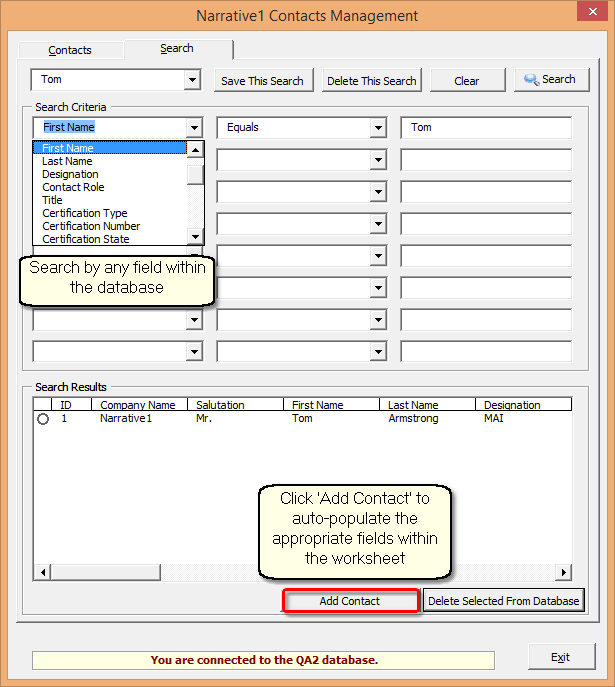 Click 'Add Contact' to update the worksheet. Click 'Exit' to return to the worksheet (worksheet updates after Exit is clicked). Click the 'Contacts' tab. If a contact is already on your worksheet, this will show on the form and can be edited, or copied. To create a new contact, simply click 'New' for a blank form and enter the information. The section showing the 'Appraisal Firm' information is shown in blue with a yellow background, which means this is information to be manually entered. It is a very good idea to enter this information in a template file which is used to start each job. Then the company information is already in the report, thus eliminating duplicate efforts. The Author's Perspective pronouns may be changed by changing one field. The following fields will update automatically.